Calling the SQ402 a 'stand' is a little inaccurate - it's actually a whole range of stands, under the one SQ402 name tag. You can opt for steel or glass base plates, metal or solid hardwood vertical supports and steel or Acoustic Steel top plates. All the bases are spiked, of course, but floor protectors are available as an optional extra, and custom heights are available too. Custom Design supplied us with both fillable metal and solid wood supports, enabling us to try both. Our test models' top plates are Acoustic Steel, which we know from previous experience is worth the £10 premium. We'd also recommend adding the company's Inert filler to the metal supports - another easily justifiable £20 to the ticket. Without Inert filler, the stands are just as stable, but adding a nicely tuned metal resonator to your loudspeakers just strikes us as unhelpful, and Inert kills the resonance pretty much stone dead. A stand with only two supports will never be quite as stable as one with three or more, but heavy ATC speakers were no challenge for our SQ402s regardless of which supports we used, and both the ATCs and some smaller JBLs we tried were, on the whole, very happy to sit atop them. 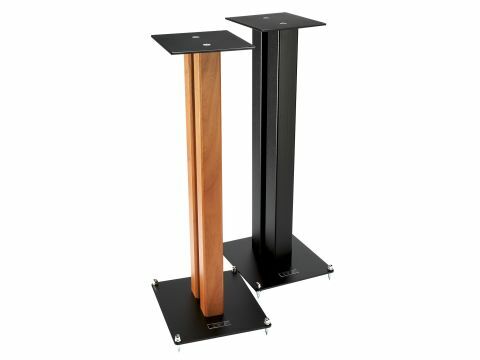 You may detect a little more upper-bass 'bloom' when using the wooden supports, but with both types you'll obtain solid images, and compared to super-solid reference stands, the SQ402s seem to have little if any effect on midrange and treble tonality. Only in the deep bass is there some element of limitation, with grip slightly weakened. Still, most small standmount speakers don't produce that much deep bass anyway, and we regard that as an acceptable compromise.